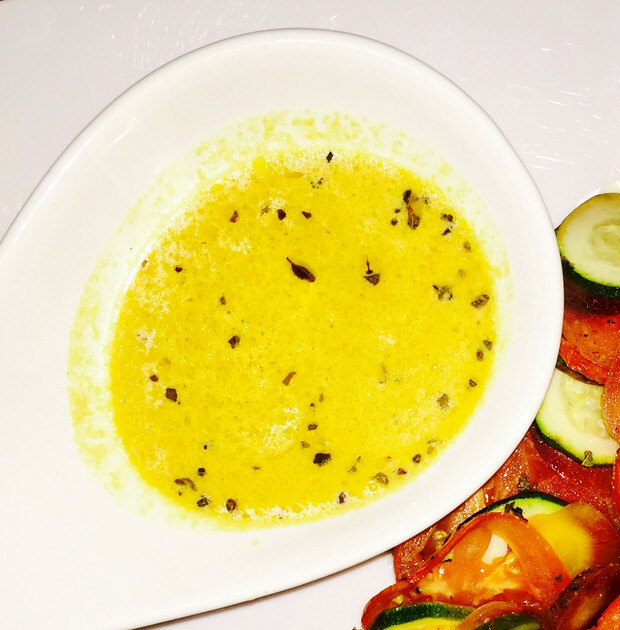 In honor of my beautiful mother who came up with the name (and inspires almost 100% of my risky cooking concoctions) I decided to call this my “Yummy Sauce.” It’s a really delicious creamy vegan garlic lemon herb dressing that can be served warm or cold and goes just perfect with vegetables. 1. Add olive oil and garlic to a pan on medium low heat. Stir and get these immersed together. You’ll want to keep everything on pretty low heat so your sauce doesn’t get a burnt taste.2. Add vegetable broth and squeeze in half your lemon juice. Keep the empty lemon peel for the next step. 3. 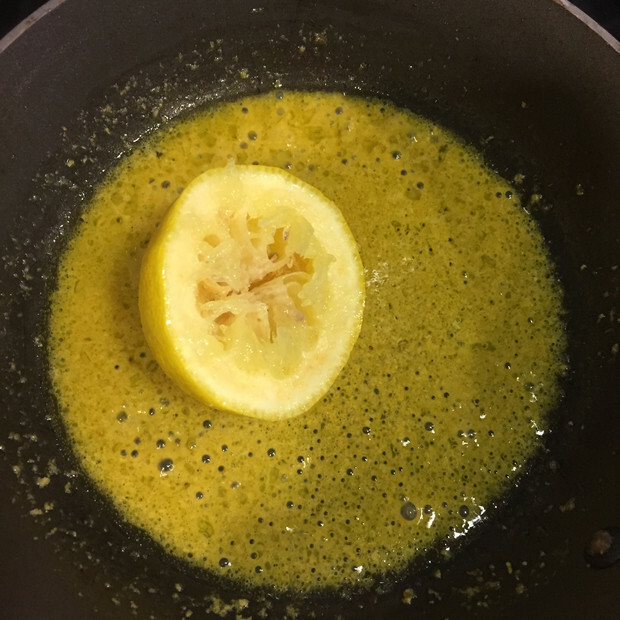 Drop in the clean lemon peel and let the delicious oils from the peel just melt into the sauce. This is a great trick if you don’t have a fancy lemon zester. You’ll get all those essential oils and flavors in your sauce without having to zest anything! Remove the empty peel after about 30 seconds and discard it. 5.Once it’s all blended to a smooth consistency add your dry herbs and seasonings a little at a time until it tastes perfect for you. 6. As a bonus and some extra creamy texture I poured in a splash of my fave coconut creamer and mixed well. It was a nice touch! 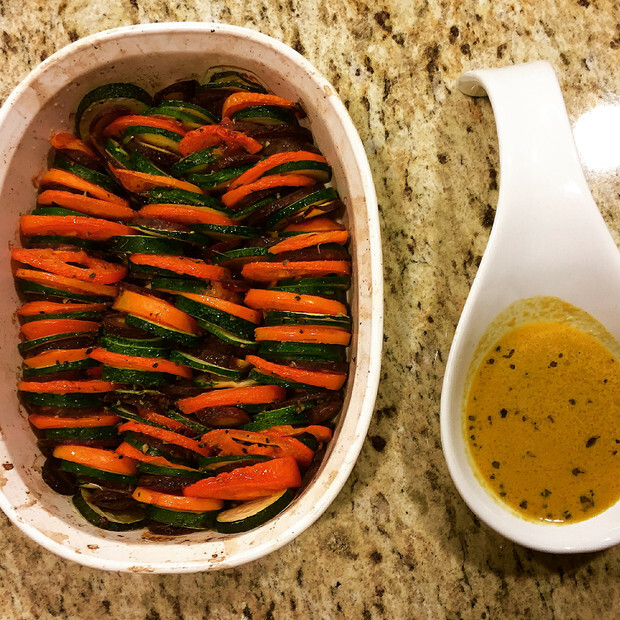 I served this alongside a Roasted Vegetable Terrine of zucchini, tomato, and heirloom carrots. It was perfect! The next day I used it as salad dressing and fell in love all over again. It truly is a YUMMY SAUCE!